Diagnosing a no-start condition often leads to a faulty coil, making the corresponding auto repair job fairly simple. There are two types of automotive ignition coils used for electronic ignition. The distributorless ignition coil and the conventional ignition coil. Both types contain two internal circuits, a primary circuit and a secondary circuit. 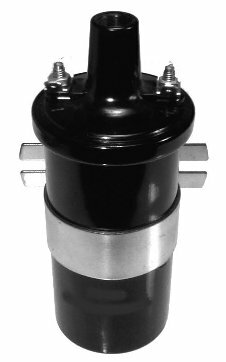 The conventional electronic ignition coil contains both primary and secondary circuit windings. The primary circuit winding consists of a large gauge wire wrapped in tight coils, around a soft metal core. The secondary winding consists of a small gauge wire wrapped in coils, around the primary circuit winding. The secondary winding is connected to the center electrode of the ignition coil. Insulation is placed between the primary winding and the secondary winding. The primary winding is connected to the secondary winding using internal circuitry. The coil produces high voltage by the collapse of a strong magnetic field, generated by current flow through the primary windings. When the primary circuit is closed, current flows into the primary windings causing a strong magnetic field to build. The magnetic field is created by the buildup of electrons inside the primary circuit. This buildup is referred to as coil saturation. When the primary circuit is opened, the magnetic field collapses, causing high voltage to be induced in the secondary windings. The voltage produced can be as high as 40,000 volts. The high voltage produced by the secondary circuit returns to the ignition coil after flowing through the spark plug wires, to the spark plugs. The waste spark distributorless ignition coil is similar in operation and construction to the conventional automotive coil, with the exception of the secondary winding. This coil contains two secondary electrodes instead of one. The secondary winding is attached to the secondary electrodes at opposite ends, creating a positive and a negative secondary electrode. Secondary current flows from the negative electrode, through the spark plug wire, bridges the gap of one spark plug, flows through the engine, then bridges the gap of the buddy cylinder spark plug and back to the positive electrode through the spark plug wire. This system generally requires a higher secondary voltage level, so the primary circuit is modified to handle higher amperage flow for increased coil saturation. Before beginning an auto repair job involving the ignition coil, it is highly recommended that you have an appropriate auto repair manual with wiring diagrams specific to your car’s make and model. 1 Comment on "Ignition Coil"
I have a 2000 infiniti I30 that I just bought. I had to replace the ignition coils and spark plugs. I just recently discovered that supposedly, the ECM on this car does like or recognize the signal of after market coils and that authentic genuine factory replacements are highly recommended. P1320 code keeps coming up and from what I have read will continue to do so until I get original factory replacements. Now here is the thing, the original coils on these cars have been known to go bad when this car was originally built. So knowing these coils go bad to begin with, they expect me to replace them with the same ones?? correct me if im wrong but wouldn’t that make me a stupid fool?? And secondly, at the ridiculous cost of OEM parts, I can’t afford them!!! So is there anything else i can possibly do to get the ECM to recognize the signals of after market coils aside from replacing the entire computer system and wiring and sensors themselves?? ?